The lovable cast of The LEGO Movie is finally back for the long-awaited sequel, The LEGO Movie 2: The Second Part. While Warner Bros. opted to push a number of LEGO-themed animated features in recent years, including LEGO Batman and Ninjago spinoffs, The LEGO Movie 2, feels like it came rather late, with a lot of the momentum from the first film having been relatively squandered. While it’s not without its humor and charm, The LEGO Movie 2 generally pales in comparison to the original. The film starts shortly after the end of the original, with Will Ferrell’s real-life dad noting to the young Finn that he will start having to let his sister play with their LEGO toys. That’s where the story begins as the celebration for Emmet Brickowski (Pratt), Lucy/Wyldstyle (Banks) and their friends is cut short by some new LEGO invaders. They lay waste to Bricksburg, turning the city into a Mad Max-style wasteland dubbed Apocalypseburg. In light of everything being not so awesome, Emmet maintains his chipper, optimistic attitude in the face of such a dark, rough and miserable existence. Lucy is all about embracing the cold, dark and brooding nature of their new existence, and she’s getting fed up with Emmet’s sunny attitude. Emmet even goes so far as building an ultimate friendship dream home for the couple. Unfortunately, a new enemy arrives to Apocalypseburg in the form of General Mayhem (Beatriz), who wants to take the strongest warriors of the dystopic city back to the queen of her home planet. 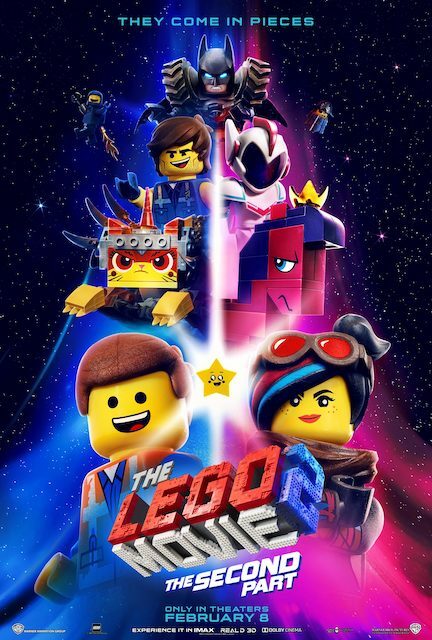 Emmet is powerless to do anything as his best friends Lucy, Unikitty (Brie), LEGO Batman (Arnett), Benny (Day) and Metal Beard (Offerman) are all taken hostage back to Mayhem’s home planet. Emmet master builds his dream home into a ship to go and rescue his friends, but he’s nearly killed an asteroid field before he’s saved by the extremely super-cool Rex Dangervest (also Pratt). Believing he’s not tough and hardened enough to save his friend, Emmet believes Rex can harden him up so he can save his friends from the clutches of Queen Watevra Wa’Nabi (Haddish). Unfortunately, the sequel for The LEGO Movie is a pretty uneven, mixed bag. The sequel doubles down on the live-action subplot, which was really the most boring and unappealing part of the original film. It’s something The LEGO Batman Movie never even bothered worrying about. The live-action segments really grind the story to a halt and break up the illusion of play for the story; that the story is a child’s imagination unfolding onscreen. The first film did much better in balancing out the screen time for all the supporting characters. Unfortunately, great characters such as Unikitty and LEGO Batman really have very little to do and are fairly inconsequential to the story. Bad Cop/Good Cop, the best character from the original, is unceremoniously written out of the story in the first five minutes, never to be seen or heard from again, and it’s the same for Ghost Vitruvius. Mike Mitchell’s vision and direction simply isn’t as Phil Lord and Christopher Miller’s for the original. The message is driven home and hammered down even more this time around. It’s a really grating, annoying message that already come through for Emmet and Lucy. The script has its fair share of clever jokes, including a lot of more adult lines and meta humor that adults will likely enjoy. But The Second Part fails to reach that joy and euphoria the first one hit. The best moments for The Second Part mostly come through with Pratt, working double-duty, as the new character Rex Dangervest. It’s basically Pratt voicing an exaggerated LEGO caricature version himself, complete with velociraptor buddies as his ship crew. At the very least, Pratt sounds like he’s having fun and going 100 percent with Rex Dangervest, who sounds like he was studying the inflections and cadences of John Wayne and Patrick Warburton before he went into record for this role. The LEGO Movie 2 isn’t terrible. It’s simply missing the ingenuity and magic that made the original such a wonderful, delightful experience. This is easily a case of sequelitis in action. If a sequel was going to take this long to make, Warner Animation Group really need to put a bit more thought into it. This is not necessarily a movie that parents and children have to avoid. Children will likely still be enthralled with the sequel, and their parents will likely enjoy the more adult-oriented humor. However, it’s simply a lesser experience compared to the original. The LEGO Movie 2: The Second Part is a overall a labored and underwhelming sequel. It lacks the heights of the original. It's not necessarily terrible, but it's not as balanced and tight as the original. Mike Mitchell fails to keep the comedy and plot flowing as well as Phil Lord and Christopher Miller. The better characters are tossed aside or have little to do in favor of less amusing ones.